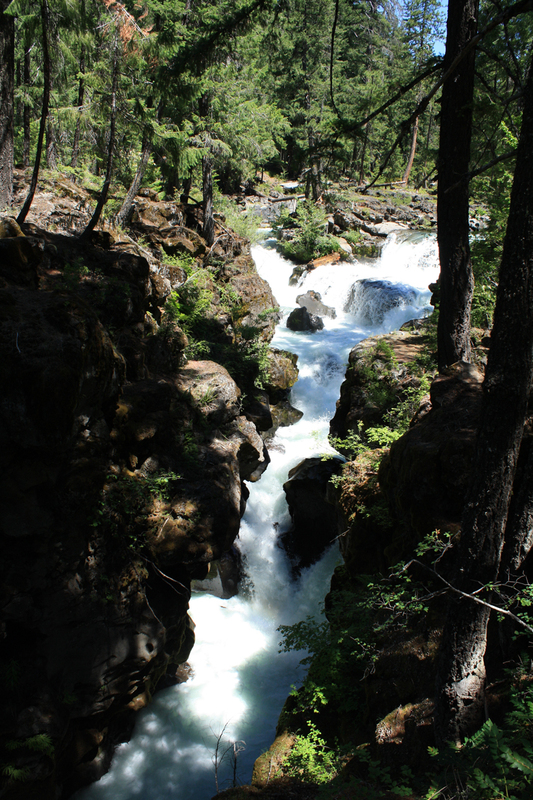 The Rogue River originates at Crater Lake National Park. It then twists, and sometimes rages (for example, through the chasm as explained and pictured below), as it winds its way to the coast at Gold Beach, Oregon. 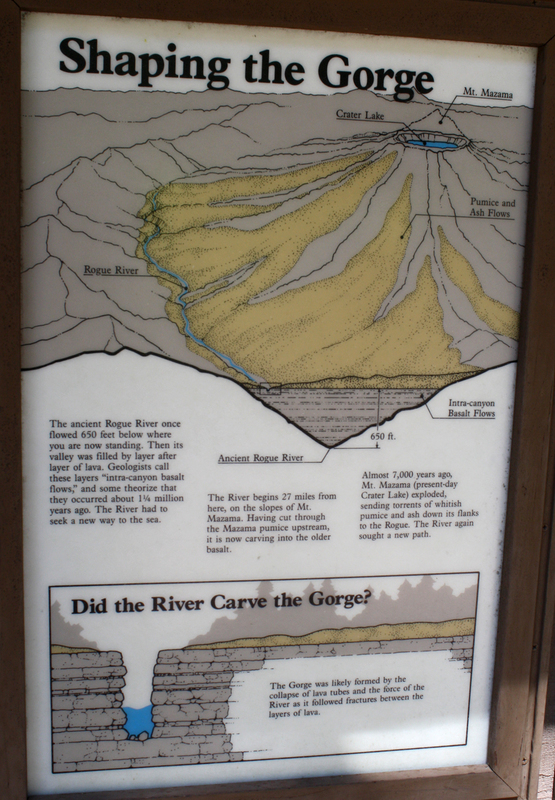 One of the placards along the gorge. Click photo to enlarge. 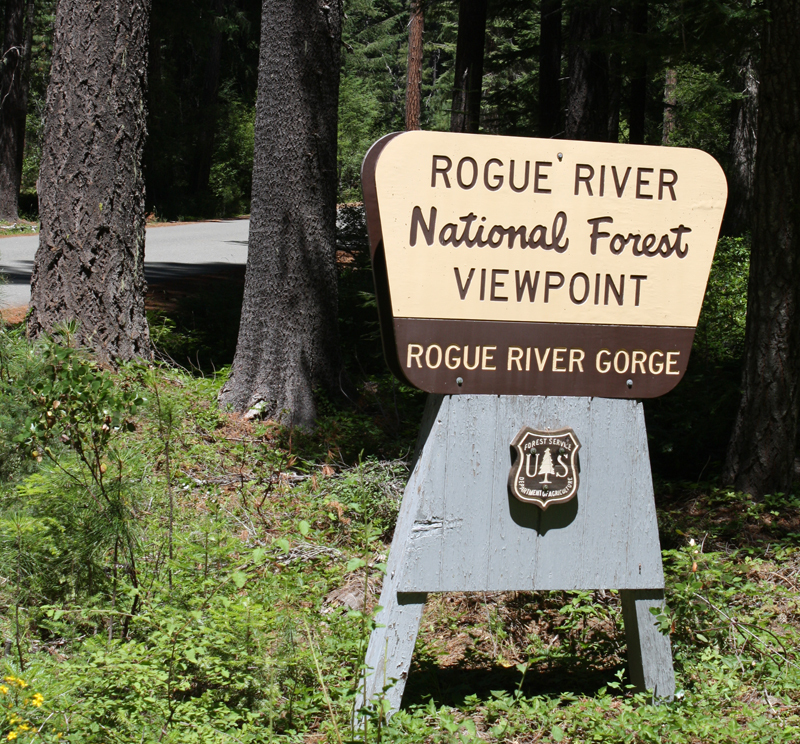 At the left is one of the informational placards alongside the Rogue River Gorge. 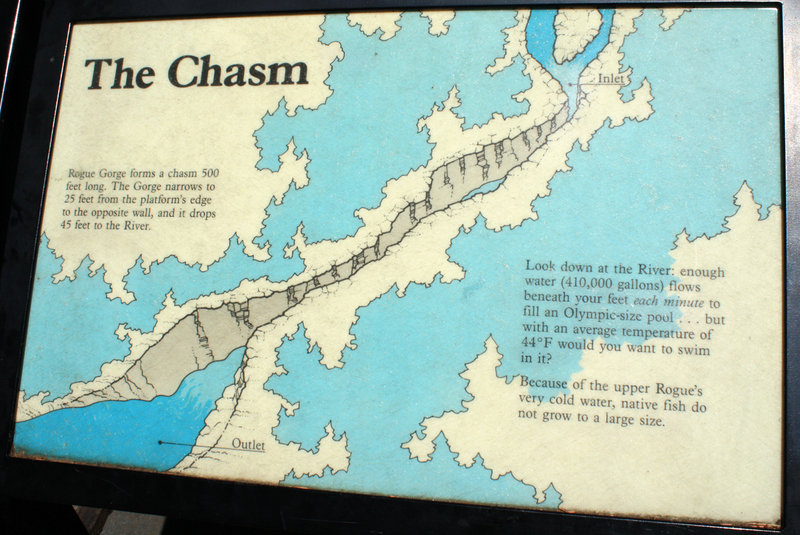 The photo below is of the upper end of the chasm that is explained on this placard to the left. Try to visualize overlaying the photo below with the upper end of the chasm in this placard illustration. The upper end of the chasm. Click photo twice to see detail. Besides its beauty, Bill and I also appreciated that the Gorge was not a touristy area, unlike the falls northeast of Portland. You can get a feeling of the power of the Rogue by watching this two-minute You Tube video of the Rogue’s Natural Bridge. It doesn’t do justice to the there-in-person beauty and rush of the gorge, but it does offer a sense of the water movement and sound. Last, but not least, a brewpub photo. 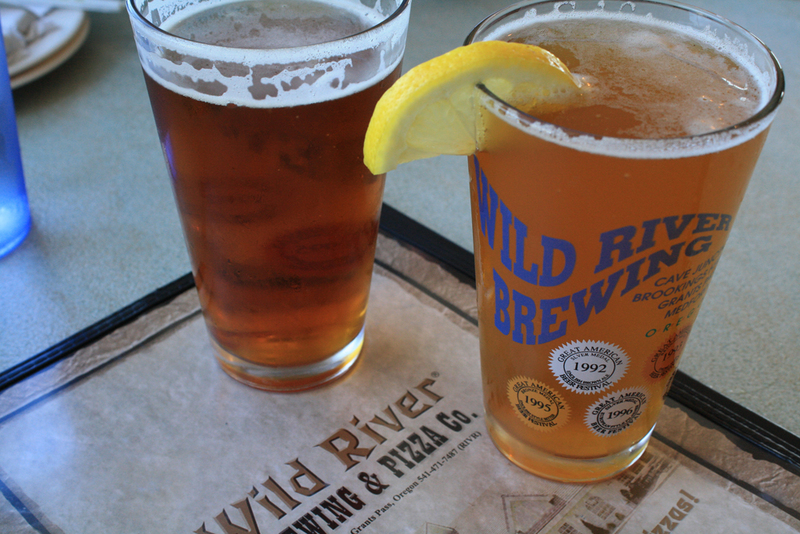 On our way to Brookings, Bill and I stopped at the Wild River Brewing and Pizza Co. in Grants Pass. The beer was fine (I had the Honey Wheat and Bill had the India Pale Ale), but what would take me back is “Bertha’s Favorite.” The menu description for this sandwich is, “Ham, turkey, jack cheese, avocado, sprouts and tomato with vinaigrette dressing, mustard and mayo.” Yum. This entry was posted on September 30, 2009 at 7:21 pm and is filed under Oregon, Travel. You can follow any responses to this entry through the RSS 2.0 feed. You can skip to the end and leave a response. Pinging is currently not allowed. Thanks so much for putting me on your email list. This particular report makes me lonesome for my uncle Jay, who was a doctor in Portland. He and quite a few of my cousins rode the rapids on the Rogue. He told Mom that one time he was very sure he was going to die. What fun to hear from you, Audrey…and I’m glad you like the email subscription feature. I’m glad the post brought memories (even if wistful ones) to you. When we rafted on the Deschutes, I was fairly scared even though that was a much milder ride than most of the Rogue trips would be. I cannot begin to imagine the sensations your uncle and cousins must have experienced. Since they did live through it…what a good story they got to share afterward! I just noticed in the comments area that asks for a web site that you had entered the web site http://audreysbook.com/. I had no idea you had authored a book. I looked briefly and will take a better look soon. Having a three-year-old grandson, and having been a teacher librarian, your intent to write books that adults will enjoy reading aloud to children sounds especially appealing. Jeff and I *really* appreciate the untouristy places, too. What a time of awe that must have been for both you and Bill. Priceless. And the sandwich–yummm! I wish I had one right now! In fact, I’m hungry and am going to go concoct something as soon as I click “send.” 🙂 Too bad Bertha’s Favorite can’t be beamed “up” to Michigan!